Professional mountain biker Jordie Lunn is grateful his personal “undercarriage” is intact after appearing in a video that shows him plunging down a nearly vertical homemade ramp in the woods. The series features plenty of awe-inspiring stunts but his latest video features one sure to make your jaw drop. 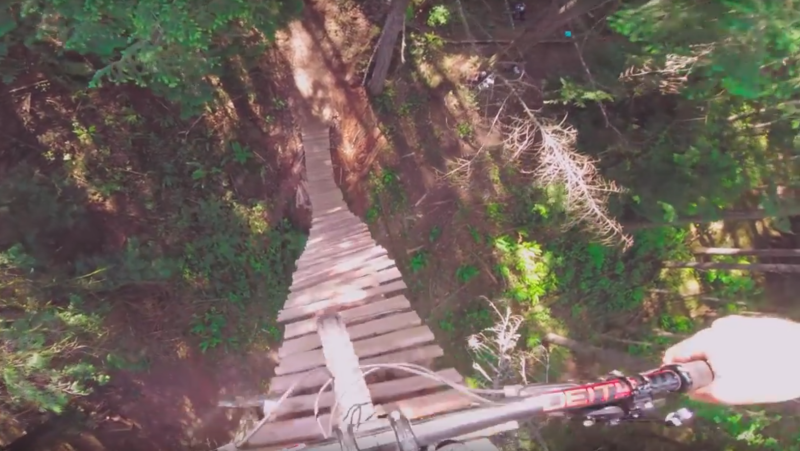 Lunn and his team built a massive wooden ramp attached to a massive tree on Vancouver Island, then made a video of him riding down it at a fantastic speed. He not only survived, but did it nearly unscathed. Lunn now laughs about only suffering minor damage to “my undercarriage” in the stunt that he initially deemed too dangerous. But after some adjustments, he made the drop several weeks later. Additionally, Lunn and his team spend “thousands of hours of work” creating his YouTube videos. The B.C. daredevil started BMX racing when he was only 11 and began mountain bike racing when he was 15, according to Rockstar Energy’s website. That’s when he said he started to dabble in cross country, downhill racing and, eventually, the freeriding he does now. But, despite what viewers who had watched the video more than 417,000 times as of Tuesday, might think, he still fears trying something new. “Just gotta get up there and push yourself over the edge,” he said. Pun intended.